New Year’s Day is waning and we’ve eaten almost all of the traditional good luck foods I planned to serve. Only the herring left. Do you have good luck traditions to celebrate the new year? My family is of mixed heritage, and on the Japanese side, New Year’s Day is a big deal – the biggest holiday of the Japanese year. At my house we must eat mochi rice cakes, which are not cakes at all but mashed up Japanese sticky rice made into patties which are then grilled or put into soup. So gooey you must be careful not to choke. I buy ours from one of our local international grocery stores, and this year they were pretty fresh! If you’re lucky enough to have a mochi-maker or a friend with one, freshly-made mochi is even more gooey and can immediately be coated in a mix of soy bean flour and a little sugar or just dipped in soy sauce and wrapped in a bit of seaweed as I do with the storebought kind that I grill over a stove eye. Mochi can also be made into desserts, but I’m used to the plain kind for new year. Traditional mochi making is pretty fun to watch! Another Japanese food tradition for the new year is eating soba noodles, which are long and thin like spaghetti noodles. The kind made of buckwheat is preferable. Long, thin noodles symbolize long life of moderation. No short, fat noodles! The other half of me is Dutch, so we usually have a jar of pickled herring around to celebrate my dad’s heritage of new year good luck. You can see that we have to space out these eating traditions! The American tradition in the South, where my husband’s family is from, is to eat peas, or rather any kind of cooked hard bean. 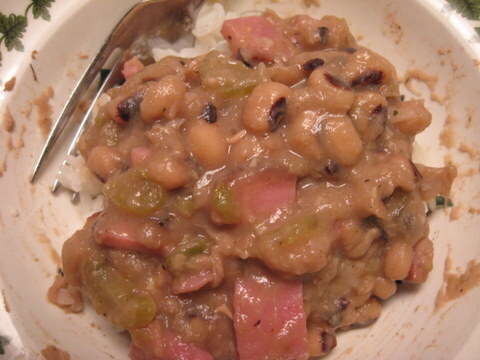 While I don’t think my mother-in-law follows that tradition, sometimes I’ll make Hoppin’ John with black-eyed peas as I did today, or perhaps red beans and rice. Whether these traditions work or not to bring good luck isn’t really the point. It’s the fun of following tradition, pretending, and good eating. Wishing you all a very happy and healthy new year! Spray a small rack with spray-type cooking oil. Place on a stove eye and turn heat to low. Place mochi cakes on the rack, leaving space between to expand. Slowly grill, turning over to cook both sides. Cakes are done when they puff up (often the inner rice will explode outwards). 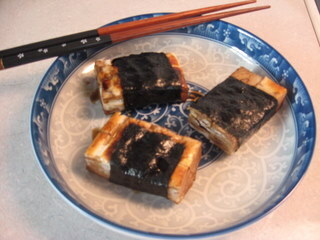 Place each mochi on a small plate of soy sauce, coat both sides with soy. Use scissors to cut a small rectangle of seaweed to fit around the mochi, coating the seaweed piece on both sides with soy sauce before wrapping around the mochi. Place the mochi on a clean plate for serving. Have extra soy on hand and chew carefully – small children and the very elderly should not eat mochi, nor should anyone with dentures! This entry was posted in holiday, recipe and tagged holiday traditions, New Year. Bookmark the permalink. Ate our mochi to insure a good luck year. Happy New Year to you! Thanks for sharing your ethnic foods and traditions. The dishes look scrumptious and healthy! Congratulations on your new website. It looks great. Wishing you ongoing success in the New Year!